A member of the Guyana Police Force’s Special Weapons and Tactics (SWAT) Team was Friday arraigned on a charge of illegal possession of guns and ammunition. 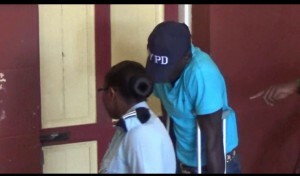 Quacy Sampson pleaded not guilty to the charge after it was read to him by Chief Magistrate Ann Mc Lennan. The charge against the 35-year old man of Kitty, Georgetown is that on December 15, 2015 he had in his possession nineteen 9mm pistols, six .45 live rounds, and five 12 gauge cartridges among other weapons while not being the holder of a firearm license. Defence Lawyer, Patrice Henry told the Court that Sampson is a policeman for more than two years now, has an unblemished record and is a member of the newly-formed SWAT team. The Chief Magistrate refused the policeman bail and remanded him to prison until February 15, 2016.